“I have been in triathlons since 2010. My first triathlon was the Disney 70.3 Half Ironman and my time was 7:55. Afterwards, I said I would never do another one. But in 2013 I signed up for Ironman Coeur d’Alene and Ironman Florida along with two half ironmans. I needed some guidance and structure so I contacted Coach Karen. 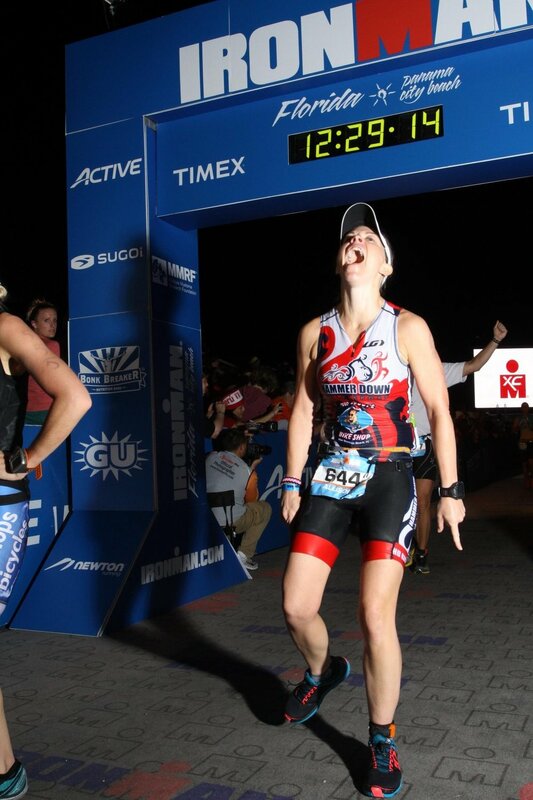 She hammered out a plan… and I was able to have an awesome finish of 13:13, even with bike and nutrition issues. We both knew then that Ironman Florida was going to go well. Next was Ironman Augusta. I was hesitant, but she said negative split the bike and run your splits and sure enough I got a 4:53 – more than 42 minutes shaved off my 2011 time. Karen has stuck by me throughout my journey. She has always been supportive in adjusting my training whenever needed and her coaching skills are priceless. Now, on to Ironman Florida, where the previous year I had set my personal record of 12:30. We talked prior to the race and she gave me my split times told me exactly what to do on the swim, bike and run portions of the race. I set an awesome new PR of 11:17. "In just a year of triathlon training under the guidance of Coach Karen, I have accomplished things I wasn’t 100% sure I was capable. Her ability to dial in a specific program to fit an athlete’s goals and potential is phenomenal. Being devoted to Karen’s training plans will no doubt provide results for anyone at any fitness level. I have seen expectations met and exceeded not only in my training, but also in her other athletes. During what seemed like too many physical setbacks over the course of my training, I was always comfortable trusting that she was the trainer and I was the athlete/student. Her credentials speak for themselves but seeing it in action was the proof. When adjustments had to be made, she would explain what was going on, why, and how it would help me achieve my goals. When it was time for her to be tough, she was tough. When it was time for her to encourage, she would do just that. Because of her guidance and my commitment to her training plan, my first Ironman turned out to be my best race to date. I would like to think I could have finished an Ironman on my own, but I know for sure it wouldn’t have been the race it was without her. Simply put Coach Karen knows what she is doing!" "Trust in coach” was my mantra for this past triathlon season. This was my second season working with Coach Karen and I found myself with more podium finishes than not with the final race of the season an age group win at Rev3 South Carolina! She took the time to mentor me through my months of intense training along with my months dedicated to injury recovery or my wedding (when training took a back seat to life). She is an amazing woman who is interested in more than just writing training plans for her athletes, she’s just as invested in my training and racing and life as I am".